Ms. Stephenson encourages families to attend University School's admission open house on Sunday, October 5, 1:30-4:00 p.m., at the Hunting Valley and Shaker Heights, Ohio, campuses. University School is one of Northeast Ohio’s top schools because of the pure excellence of the faculty. Long before she joined University School, Sara Stephenson, the newly-appointed Director of Enrollment Management, was passionate about the school. In her new position, Ms. Stephenson, 43, is charged with building a robust and sustainable applicant pool of the best and brightest boys in Northeast Ohio. Ms. Stephenson said she is proud to be working within a community that is deeply committed to providing boys with an immersive, inter-disciplinary program to help them excel and reach their goals. Ms. Stephenson said it is exciting to be living in a city where a school’s 124-year history and reputation are so prevalent. Prior to joining University School, Ms. Stephenson was Head of the New School in Fayetteville, Arkansas. 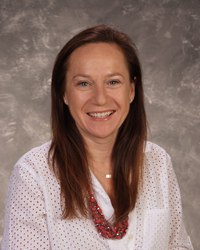 She was Director of Middle School at Hathaway Brown from 2008 to 2010, and served as Assistant Director of Middle School at Blake School in Hopkins, Minneapolis from 2005 to 2007. Ms. Stephenson comes to University School with an extensive educational background. She served as an educational consultant for the Hale School in Perth, Australia, where she developed an online interdisciplinary classroom with students from five different states. She has facilitated faculty workshops on conflict resolution and educated board members about curriculum and 21st century skills. She is also the founder of the “London Trip”, a non-profit organization that takes middle school students on summer trips to London to study British culture. Ms. Stephenson graduated from the University of Bristol, UK, where she earned her Bachelor of Science in Earth Science and graduated as valedictorian. She then went on to obtain her Master’s of Education from the University of Cambridge, UK. Sara Stephenson lives with her husband, Paul, and two sons in Hunting Valley, Ohio.